Born in Senegal (Africa) in a half spanish and french family, Bob Bonastre felt in love with guitar at fourteen. Presented as "one of the next best guitar players" by the french jazz press a few years ago, he decided, after many years of playing electric music with jazzmen, to follow another road, closer to his heart. If jazz, rock and contemporary music belong to his culture, his work on the nylon strings guitar has opened to him a new direction, in which the sound is as important as the note. He plays most of the time his own compositions in solo concerts, introducing a very large language, made of harmonies sometimes complex, unusual sounds by usinga chinese stick or a piece of paper, and more and more, an astonishing three octavias voice. His music speaks about travels, inner travels or around the world, taking the audience from continent to continent, with always the link of emotion and spirituality. 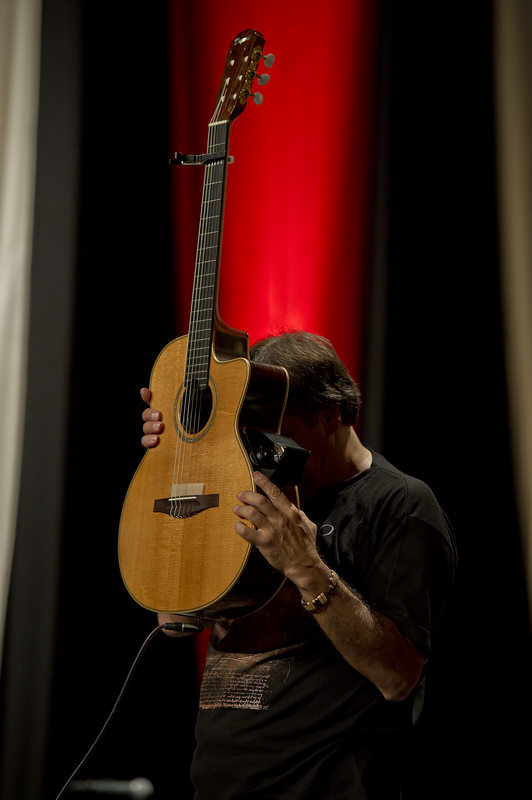 Rewarded at the Lausanne International Guitar Competition, Swiss(Electric contemporary guitar), and at the International Osnabrück Competition, Germany (Acoustic guitar), Bob has worked on several music for ballets, theater (Off in Avignon festival, Radio France, Maison de la culture de Bobigny), has composed "d'Afrique en Amérique Latine", a command for quartet (Ville de Saint-Cloud). Bob Bonastre plays in France: Jazz Festival "Avril swingue en mai" , now "Sons d'hiver, "Les Instants Chavirés, le Triton, le Réservoir, Festival de jazz de Saint-Denis, théâtre Dunois, Festival International de guitare d'Issoudun, festival des Alliances de la guitare, Guitarmaniaks in Colmar, Guitar'Land, Les Automnales de Ballainvilliers...and also abroad: French Cultural Centers in Africa (Gabon, Cameroon, Equatorial Guinea), International Festival of Sacred Music, Fès, Morocco, Europe (Germany, Italy, Hungary, Czech Republic, Croatia, Nederlands), India, Brazil and USA. David Venitucci on Accordion & Christophe Wallemme on Doublebass.